A music lover from a young age, Tiffin graduated from Augustana College in Sioux Falls, South Dakota with degrees in flute performance and English. She then went on to attend the Arizona State University School of Music and received a master degree in flute performance. Besides teaching flute students for over 20 years, Tiffin has also enjoyed performing in South Dakota, Arizona, and Minnesota and is still active locally performing for weddings, musicals, and other events. She is a member of both the National Flute Association and the Upper Midwest Flute Association. Tiffin began piano lessons in first grade and continued to study privately through her freshman year in college. She also accompanied juries at the college level. 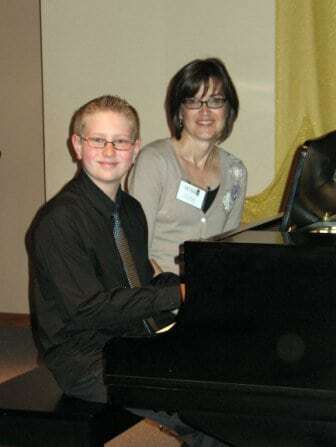 Four years ago, she began teaching piano students in addition to flute. She currently is a church choir accompanist and parochial-school staff accompanist and enjoys accompanying her students, too. Along with playing the flute and piano, Tiffin is organist for two local churches. After stumbling on the opportunity to play organ, she caught the bug and studied organ privately at Concordia University in St. Paul, Minnesota.